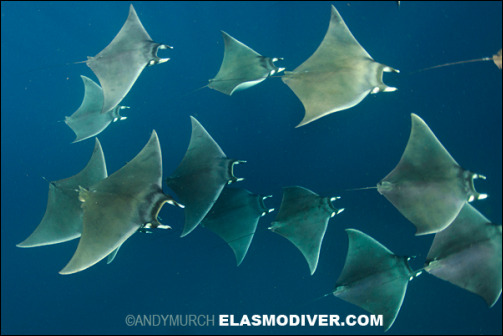 Devil and Manta Rays (Mobulidae) are a family of species that are highly mobile, broadly distributed and routinely cross international boundaries. They are globally threatened by directed and non-directed fisheries that retain these fishes for their gill plates, which are highly valued in Asian markets. Over the past five years, restrictions on fishing and trade have been increasing for both devil and manta rays. However, the implementation of effective protections depends entirely upon the availability and communication of relevant scientific knowledge, to those people best placed to take action. In 2014, the IUCN Shark Specialist Group (SSG) convened a workshop aimed at developing a global strategy for the conservation of devil and manta rays. ​​The role of the SSG in advancing this conservation strategy was to provide a suitable environment and framework for a broad group of people and organizations who play key roles in the conservation of devil and manta rays, The global conservation strategy was released in early February 2016, prior to the Convention for Migratory Species (CMS) Sharks Memorandum of Understanding (Sharks-MOU) Second Meeting of the Signatories (MOS2), where it was available for Signatories as an Information Document. Lawson J.M., Walls, R.H.L., Fordham, S.V., O'Malley, M.P., Heupel, M.R., Stevens, G., Fernando, D., Budziak, A., Simpfendorfer, C.A., Davidson, L.N.K., Ender, I., Francis, M.P., Notarbartolo di Sciara, G. and Dulvy, N.K. 2016. Sympathy for the devil: a conservation strategy for devil and manta rays. PeerJ PrePrints 4:e1731v1. ​The SSG Devil and Manta Ray Newsletter: The aim of the Devil and Manta Ray Network Newsletter is to provide updates on the status of the Global Devil and Manta Ray Conservation Strategy, and to inform the community of the latest scientific updates. Please contact us if you'd like to be included in the e-mailing list. Fisheries Society of the British Isles: Biology, Ecology, and Conservation of Elasmobranchs, 2015, Plymouth, United Kingdom. The SSG held a special session on Mobulid Biology, Ecology, and Conservation. Speakers from the Manta Trust, Project Manta, Scripps Institution of Oceanography, Plymouth University, and the University of Queensland presented their research. The session was moderated by IUCN SSG Co-Chair Dr. Nicholas Dulvy. Devil and Manta Ray Conservation Strategy Workshop, 2014, Durban, South Africa. A group of devil and mantra ray experts gathered for a conservation planning workshop, where tables of suggested goals, objectives and actions were developed. These tables were circulated to the wider devil and manta ray community following the workshop.